Supt. 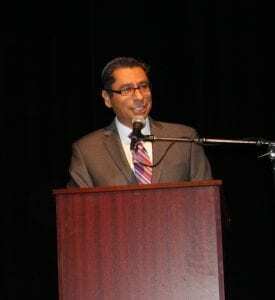 Luis Rankins-Ibarra gave an upbeat State of the School District address Monday morning at the California Center for the Arts, Escondido. This was Dr. Ibarra’s second such annual address. It was a joyful celebration of the progress the district has made in the previous year and a look ahead towards achieving other goals. Welcoming the audience Monday was Leila Sackfield, deputy superintendent of the Escondido Union School District. Playing welcoming music was the Rincon Middle School Band, led by Roger Anderson. Rincon Band Student Keith Counts led the pledge of allegiance. Eloisa Guerrero, an employee of the district, sang the National Anthem. Doug Paulson, president of the school board, welcomed guests and assisted Supt. Ibarra in presenting the Public Champion award to the San Diego Children’s Discovery Museum. He introduced Javier Guerrero, executive director of the San Diego Children’s Discovery Museum. The district is the sixth largest elementary school district in California. It serves 16,200 students within 77 square miles, with 23 schools, including 17 elementary, five middle schools, and one intermediate school. It employs 1,900 employees, making Escondido Union School District the second largest employer in the city. It has an operating budget of slightly more than $194 million. The diverse student population is 75% low income, and 47% English learners. Under the state’s School Dashboard, the new accountability system, performance is measured, utilizing a color-coded system from blue, which is highest and red being the lowest. The district has five schools in the blue (Bernardo, Rock Springs, Felicita, Orange Glen, and Conway) eight schools in green (Juniper, LR Green, Del Dios, Glen View, North Broadway, Pioneer, Farr, and Mission Middle School) two in yellow, (Lincoln and Rose) and eight in orange (BVMS, Central, Oak Hill, Quantum, Reidy Creek, Rincon, Miller, and Hidden Valley) with zero schools in red. In English Language Arts, the district has no schools in blue, four in green (Bernardo, LR Green, Quantum, and Miller) ten schools in yellow [Reidy Creek, BVMS, Conway, Del Dios, Farr, Oak Hill, Orange Glen, Pioneer, and Rose) nine schools in orange (Felicita, Glen View, Hidden Valley, Lincoln, North Broadway, Rincon, Central, Mission, and Rock Springs) and zero schools in Red. 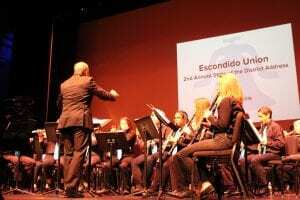 The Rincon Middle School Band and Roger Anderson performed prior to the address. In Math, the district has zero schools in blue, four schools in green (Bernardo, LR Green, Quantum, and Miller) eleven in yellow (Reidy Creek, Central, Del Dios, Farr, Glen View, Juniper, Lincoln, Pioneer, and Rock Springs) eight in orange (Rincon, Bear Valley, Oak Hill, Hidden Valley, Mission, North Broadway, Orange Glen, and Rose) and no schools in red. “While the majority of our schools are trending in the mid to lower mid-levels, we do have schools who have reached high levels of achievement (green) and are approaching very high-level status,” said the superintendent. “Obviously we are not satisfied with where we are, however, as we delved deeper into our results, we again were encouraged by the results of many of our grade levels in various schools where double digit gains were made,” he said. He announced that Miller School and Quantum Academy were recently named Honor Roll Recipients by the Educational Results Partnership and the Campaign for Business and Education Excellence in 2017. After consulting with stakeholders taking part in the Local Control and Accountability Plan (LCAP) the district is investing in its people by providing ongoing embedded professional development, offering ongoing support in the field and by providing a fulltime instructional coach for every site to model, plan, and co-teach lessons. The district is providing a School Based Resource teacher to coordinate and monitor intervention services at every site. 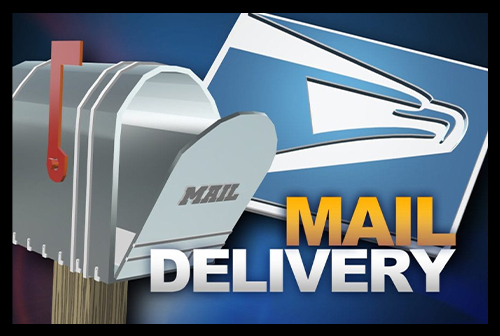 They provide a social worker for every site, and a licensed vocational nurse for every site. “As we look to addressing the social emotional needs of our children, we have begun to incorporate trauma informed practices into our system. We are creating an awareness and understanding of the impact of trauma on academic and long-term health outcomes for youth,” he said. The district has added credentialed physical education teachers to elementary grades in first through fifth grade so all students in grades 1st through 8th grade receive PE by PE specialist as part of their educational program. To encourage parental support they provide a fulltime Family Liaison for every school site who helps coordinate the many ways families can be engaged in their child’s education. They can attend Family Days where parents are invited to eat lunch with their children and attend a short quick workshop on a topic of interest. The family engagement program helps parents become partners with their child’s education. This program recently received the 2017 Golden Bell Award by the California School Boards Association. Stakeholders were clear that students should be provided as much enrichment as possible. “Exposing our students to a variety of enrichment opportunities is sure to ignite a passion from which we could cultivate and nurture. We have designed very deliberate experiences which all students in our district will experience. In fact, as our enrichment program continues to grow, it has lent itself to strengthening and even expanding our community partnerships,” said Ibarra. The district’s relationship with the San Diego Children’s Discovery Museum continues to grow, he said. Pre-school through Kindergarten students are provided with a field trip to the museum. In addition, all preschool families are given complementary memberships and all schools have family passes available for check-out. The district also partners with the California Center for the Arts to provide enrichment in the Visual and Performing Arts. The district’s newest partner, Treobytes, whose goal is to make technology accessible to all children, is conducting a pilot enrichment program at four elementary sites and three middle school sites. They are working with students on computer coding, 3 D printing and with older students building a computer. A Step Beyond recruits students through their Fall Into Dance program, where students in third, fourth, and fifth grade receive free dance classes for several weeks. Students are then invited to audition for 40 to 50 spots. Scholarships can provide them with A Step Beyond services through high school graduation and beyond. These services include dance lessons, tutoring services, and mentoring. The superintendent highlighted other organizations such as San Elijo Lagoon Conservancy, Palomar YMCA, The Friends of Daly Ranch, California State University, San Marcos, and Coast to Soccer, which gives students an opportunity to interact with college soccer players. Through a partnership with the Boys & Girls Clubs they offer sports programs to students in four ASES middle school programs such as flag football, volleyball and soccer. Partners from the City of Escondido provide the Reading Express, a mobile lending library that visits each ASES elementary school weekly. Additionally, free books are donated to this mobile library by Barnes & Noble through the Children’s Initiative, a children’s advocacy group and ASES consortium collaborator. The Escondido Education Foundation supports innovation and technology in classrooms by making grants available to teachers. This year they donated over $50,000 directly to the classrooms to help fund innovative programs that directly support our kids. Dr. Luis Rankins-Ibarra, superintendent of the school Escondido Union School District, poses with staff members of the San Diego Children’s Discovery Museum. 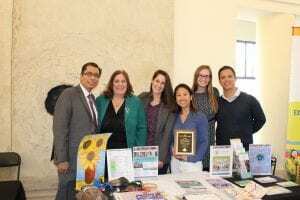 Shown are (from left) Dr. Ibarra, Leila Sackfield, Deputy Superintendent, and from the San Diego Children’s Discovery Museum: Monika Tucker, Amanda Lee, Kimberly Tomlinson and Javier Guerrero, executive director. The Escondido Charitable Foundation donated grants directly to our school district over the years. In addition, many of the partners we have mentioned have also been generously supported by the foundation, and indirectly, have benefited our students and our community. Dr. Ibarra highlighted the district’s newest school, Quantum Academy, which opened in 2015 as an intermediate school serving grades 4-8. Quantum Academy offers a small school experience with a strong focus on Technology and Innovation. During EXPLORE classes, students are exposed to a variety of topics and opportunities that might ignite a passion. Students also have a “genius hour” where they can work on projects they have chosen to research deeper. The school was recently named an Apple Distinguished School for its innovative use of technology. Dr. Ibarra also highlighted Conway Elementary, where the approach to project-based learning teaches students how they can impact their community. Most recently, Conway was among eight schools nationwide to receive recognition and a grant of $5,000 by the Better World Project for exemplary lesson design of a project called Protecting and Serving our Local Watershed. The third highlighted campus was Del Dios Academy of Arts and Sciences, where students are exposed to both arts and sciences to discover their passion. They select a pathway in either the arts or sciences and explore deeper in yearlong electives. They have opportunities in visual arts, performing arts, such as drama and dance, to science where they can take special classes such as forensic science, engineering, or computer coding. Because of this access to the network, the district has launched a one-to-one IPAD initiative where every student will be provided with an IPAD by the year 2021. Currently students in grades 4th and 5th are receiving their IPADs as part of their instructional program. Students will be able to access copies of their textbooks, work on projects utilizing various multi-media modalities, while filtering all content through the district’s secure network. Students will learn how to find, filter, and apply information in the 21st century. Schools are being modernized. Orange Glen’s underground utilities and plumbing have been replaced and flooding and water run off issues corrected, leaving behind a beautiful new courtyard and playground structure. Quantum Academy classrooms and HVAC systems have been replaced while providing additional classrooms to accommodate the school’s full build out. Mission Middle School is in the middle of a major transformation with a two-story Math and Science Building to accommodate their STEM focus. Central Elementary School, built in 1938, the oldest school in the Escondido Union School District, is receiving a face-lift while maintaining its old-world charm. Along with electrical, plumbing, and sewer infrastructure work, two new preschool and kindergarten complexes will soon be ready.